Dr. Cleveland Evans writes about names for the Omaha World-Herald. In his July 4th column, he looks at the history of the name America. America was named after Italian navigator Amerigo Vespucci (1454-1512.) He was born in Florence and named after his paternal grandfather. The Normans brought a French form of the name to England, where it became Amery or Emery. In Latin, Amerigo became Americus. Américo is the Spanish form. América has been used as a woman’s name throughout Latin America — fittingly, since South America was given its name. Hispanic immigration brought America back into the top 1,000 U.S. names in 1998. For unknown reasons it later boomed with Latino parents, peaking at No. 410 in 2002, when 704 children were given the name America. 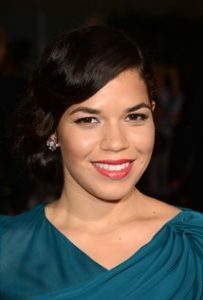 It’s tempting to link that surge with actress America Ferrera. Born to immigrants from Honduras in Los Angeles in 1984, she was named after her mother, América Griselda Ayes. Read more about the history of the name America here!